Acclaimed Scottish poet Don Paterson will give a reading at 6 p.m. Wednesday, April 11 in the Robert W. Woodruff Library on the Emory University campus. 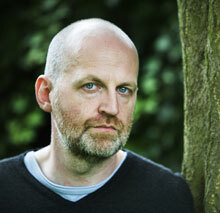 Acclaimed Scottish poet Don Paterson will give a reading at 6 p.m. Wednesday, April 11 in the Robert W. Woodruff Library on the Emory University campus. The event, which is free and open to the public, will be the 20th reading of the Raymond Danowski Poetry Library Reading Series. Paterson is the author of several award-winning poetry collections, including the recent "Rain" (winner of the Forward Prize), "Orpheus" and "Landing Light." "Ask any reader of British poetry to identify who is doing the best work right now, and you should get short odds on the answer being Don Paterson," writes the Boston Review. The New Yorker calls him "a poet of surface gorgeousness (he rhymes, he writes in chiming little stanzas), who is nevertheless right at home in the dark." A fellow of the Royal Society of Literature, Paterson has been the recipient of the Whitbread Poetry Prize, the Queen's Gold Medal for Poetry and the Geoffrey Faber Memorial Award. He has been awarded both the T.S. Eliot Prize and the Forward Poetry Prize on two occasions. Paterson also was appointed Officer of the Order of the British Empire (OBE) in 2008. In addition to being a talented poet, Paterson is also a musician, an active composer and a professor of poetry at the University of St. Andrews, Emory's sister university. "He's a great poet. He can write in traditional forms with ease, while crafting his own; he also can connect with deep emotion and convey that," says English and creative writing professor Kevin Young, curator of literary collections and of the Raymond Danowski Poetry Library at the Manuscript, Archives, and Rare Book Library (MARBL) at Emory University. "His poetry is heartfelt and musical and makes terrific use of meter and rhyme, reminiscent of Derek Walcott, Robert Frost and Seamus Heaney." The reading will take place in the Jones Room on Level 3 of the Woodruff Library, 540 Asbury Cir., Atlanta, GA 30322. A selection of books and a limited-edition broadside will be available for purchase and signing. Light refreshments will be served following the reading. The event is part of the Raymond Danowski Poetry Library Reading Series, sponsored by MARBL, the Hightower Fund, and Emory's Creative Writing Program.